After you add your recipe for the first time, you may want to edit it. The steps to edit a recipe are very slightly different for the Block Editor vs the Classic Editor. 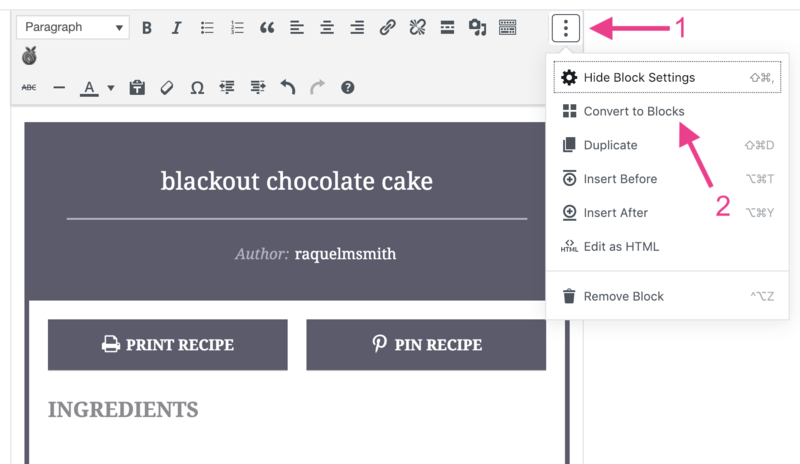 To edit a recipe in the block editor, simply hover over the recipe and click. The recipe edit window will appear. If the content was previously built in the Classic Editor, then later opened in the Block Editor, the content must first be converted into blocks before the recipe can be edited. After converting the content to blocks, you can open and edit the recipe by clicking on the recipe block as described above. To edit a recipe in the Classic Editor, first make sure you are in the "Visual" editor, not the "Text" editor. Scroll to your recipe, click on the recipe card, then click the pencil icon that appears at the top. The recipe editor window will appear. Make your changes, then click "Update" at the bottom.